The Lord said to me, “Go down to the potter's house, where I will give you my message.” So I went there and saw the potter working at his wheel. Whenever a piece of pottery turned out imperfect, he would take the clay and make it into something else. Then the Lord said to me, “Don't I have the right to do with you people of Israel what the potter did with the clay? You are in my hands just like clay in the potter's hands. In our travels we have visited museums associated with the ruins of a Roman or Greek town or temple or amphitheatre. It’s amazing to see what artefacts have survived all these centuries for us to admire today. There are things that you wouldn’t expect to have lasted 2,000 years of storms and earthquakes and volcanoes, covered by metres of dirt, trampled over by wars, and whatever else; things like mosaic floors and skilfully crafted mosaic walls with pictures of hunting scenes or a victorious general riding in a chariot drawn by four horses all still intact and able to be viewed just as a wealthy Roman family would have seen them 2,000 years ago. There are statues and ornamentations some intact and some skilfully reconstructed. Pots and pottery items were used by rich and poor alike. Some were obviously artistic masterpieces with ornate decorations and would have taken pride of place in a home, others were for everyday use. In the first century BC the Romans made bottles and jars and jewellery from glass. What is so amazing is that archaeologists are finding these delicate objects intact made from very fragile and breakable material or are able to reconstruct them and we are able to admire them today. We might call the Romans and Greeks ancient civilisations but they certainly didn’t lack creative and artistic skills. We hear about pots and a potter in today’s Old Testament reading from Jeremiah. Jeremiah is told by God to go down to the potter’s workshop and he finds a stool and sits there for a while watching the potter at work. The potter is used to people coming and going from his workshop but this stranger just sits and watches. He watches as the potter takes a lump of clay. He works the clay to get rid of any lumps and unwanted bits. He plonks it on the wheel as the wheel goes round and round the pot takes shape in the potter’s hands. But as the pot takes shape something goes wrong. The pot collapses. Jeremiah continues to watch as the potter, completely unfazed by this, squashes the clay down again and remodels it into the finest pot ready for the kiln. We know that Jesus often used parables and pictures to get across to his listeners important truths about God and his love for his people. As Jeremiah watched the potter at work, he was watching a parable that explained God's love for his people and what he needed to do bring them back home to him. God was about to use some ‘tough love’. God says that he created his people to be like a beautiful pot but like the pot on the potter’s wheel they have gone out of shape and all wrong. “Now”, he says, “I am going to squash you down and start over again”. Jeremiah is given the unpleasant task of announcing to the people of Israel this bad news. God says, “Now then, tell the people of Judah and of Jerusalem that I am making plans against them and getting ready to punish them. Tell them to stop living sinful lives—to change their ways and the things they are doing” (Jer 18:11). God knows that this news about his plans to punish his people is not going to go down well and that Jeremiah will become discouraged so he wants Jeremiah to keep the image of the clay in his head. For the clay to become beautiful and useful once again it must first be squashed down. This is not just a squashing down for the sake of squashing down or squashing down to throw it away. God wants Jeremiah to keep the final goal in mind and most likely this was impressed on Jeremiah as he looked around the potter’s shop and saw all the beautiful pots that once were lumps of clay sitting on the potter’s wheel being moulded in the hands of the potter. The purpose of the tough love that God was showing here was to make them into his beautiful people once again. Last week I was watching a video clip for Father’s Day and it finished with a father and his young daughter lying on the grass looking up at the clouds. The little girl says, “God has the coolest job getting to make clouds all day”. Her dad says, “Yep, he does”. As he looks at his daughter and smiles he says, “But I think one of his very best jobs was when he made you”. We are loved so dearly by our heavenly Father. He knows us intimately and personally. He wants absolutely nothing to harm us or hurt us or prevent us from enjoying peace and joy. His greatest desire is that we enjoy the perfection of heaven. We are created to be his beautiful people now and in eternity. However, while we are here in this life things can go terribly wrong for this lump of clay and we go all out of shape. The attitudes of other people and the world around us make us into a shape that is not the shape God designed us to be. Sometimes our bad choices make us into wobbly lumps of clay. Sometimes trouble, sickness and disasters in our lives overwhelm us and we no longer feel the hands of God around us moulding us and guiding us. Sometimes we lose our way as disciples of Christ; we no longer believe that Jesus’ love moulds and shapes our lives. Sometimes we simply don’t want to be the shape God wants us to be. However, regardless of the reason, we become wobbly and misshapen lumps of clay, God is always ready to reshape and remake and renew us; to make us into the beautiful people he intended us to be. Sometimes the only thing God can do is to break the clay down into a lump and start again. Just as Jeremiah saw the potter break down the lump of wobbly clay and start again, so God starts again with you and me. It is okay to be broken down by God. It’s not a comfortable experience, even in such loving hands. It had to happen to Israel as a nation and it happens to us as individuals. We do need to be broken down by God, and to let the master start again remoulding us. When we feel as though we are being squashed us down by words from God from the Bible, a preacher or a friend who point out we have been unforgiving, unkind, unhelpful, impatient, lazy, selfish, unco-operative and uncommitted to his work in the church, that’s God telling us that we aren’t the perfect piece of pottery that he wants us to be. Don’t hastily or casually brush it aside. His hands are wanting to reshape you. We have become wobbly lumps of clay on the potter’s wheel and not the beautiful creation he intends us to be. Our flaws are clear, our blemishes are exposed, our weaknesses and defects are laid bare by the Word of the Lord. It’s clear the potter needs to start again. For the clay to be malleable again the potter needs to add water. To remould us God uses water – the water of baptism and his Word of promise. He takes us and changes us and gives us a new life and a new name. He joins us with Jesus and his death and resurrection. And with Jesus comes the Holy Spirit – God's breath who creates new life in us not just once but every day he renews us and reenergises us to walk God's ways and to do God's will. Every day the Holy Spirit creates faith in us and calls us to repentance because every day our tendency is to become wobbly lumps of clay again. Every day the Holy Spirit reminds us of who we are and what Christ has done for us and what our calling is. He calls us to turn away from our wobbliness and with his help to be reshaped into the beautiful people God created us to be. Every day he recreates us, reshapes and remoulds us. The potter is an incredibly patient man as he moulds and reshapes a lump of clay until it is just right. He might do it a number of times and won’t stop until he has created the beautiful pot that he intended in the first place. That’s the picture of our God. God is like the potter – breaking down, reshaping and he continues to do that to this day. Our God is our Saviour who is always willing to start again and again as many times as necessary and gladly makes us into perfect pots. Our text from Jeremiah also contains a word of warning to those who refuse to be squashed down and remoulded by the loving hands of the potter. that God can salvage us, and make us beautiful. God, like the potter, has that one purpose in mind. 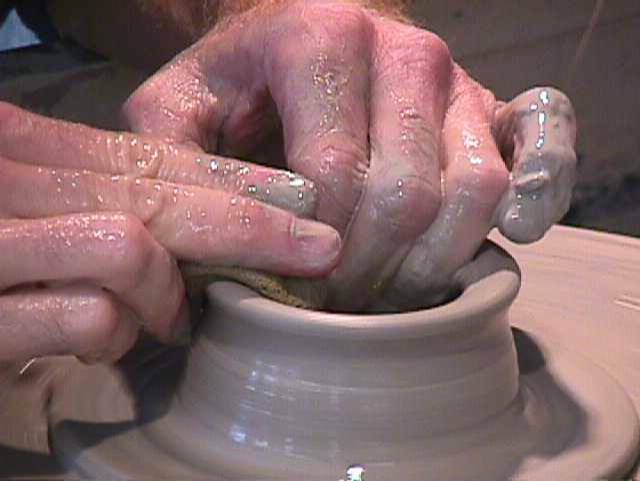 As Jeremiah watched the potter squashing down and reshaping the clay to make a beautiful pot he was learning something valuable about God's love, his grace, his patience and his constant desire that we are more than wobbly lumps of clay but in God's hands we are his beautiful creation.